Mablethorpe almost squandered a 3-0 lead, but held on to win 3-2 against CGB Humbertherm Reserves. A spirited Humbertherm Reserves side came close to pulling off an astonishing comeback. They were trailing 3-0 with 13 minutes left and scored twice before nearly equalizing. Mablethorpe managed to hang on for a massive three points though. 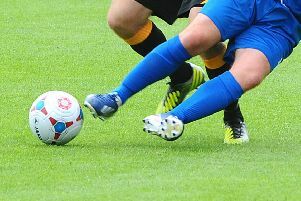 Peter Hanley was recalled to Mablethorpe’s first team and he marked his return with an early goal. The young striker latched onto Lee Bebbington’s through ball and blasted into the roof of the net. Mablethorpe took the game to Humbertherm after making a perfect start. Skipper Mathew Sirett forced visiting goalkeeper Josh Ward into a great save before Lee Twigg bagged the first of his two goals. It came when Twigg rode a challenge by Martins Simons and dribbled into the box to score his one-on-one with Ward. Within minutes of the restart Adam Brownson cut inside from the left and squared for Bebbington who slid in only to miss the target. Right at the end of the first half Humbertherm’s James Blunden curled a free kick narrowly over top. That was the closest Humbertherm had come in the opening 45 minutes and they were 2-0 down at half time. Early in the second half Brownson somehow rattled the crossbar with a freekick from a long way out. On 64 minutes Luke Turner replaced Hanley. The substitute looked sharp after coming on and forced Ward into a good save at his near post. At the other end Max Billingham made one of his perfectly timed challenges at the feet of Simon Worthington, who was about to shoot. Billingham has come to Mablethorpe’s rescue many times this season and unsurprisingly he was the man of the match. In the 75th minute Twigg netted his second by controlling a long punt from Jamie Pittam and firing in. At that point it seemed hopeless for Humbertherm, but they never gave up and responded with two goals. The first of those was a penalty after Bebbington fouled Robin Beecroft in the area. Beecroft took the spot kick himself and scored to give Humbertherm a glimmer of hope. Soon afterwards Humbertherm won a freekick in a dangerous position. Robson McKeon took it and found the net to set up a nervy ending. Humbertherm pushed forward for a dramatic equalizer and almost got it from a Liam Wilkinson corner that looped onto the crossbar. Then deep into stoppage time Ryan Kirk crossed for Worthington whose diving header flew inches wide of the left post. Seconds later Mablethorpe were mightily relieved to hear the sound of the final whistle. Mick Stubbs was more than satisfied. He said: “The lads played with a lot of confidence and determination to earn three vital points. “We settled down a lot quicker than we did in our last two matches and were in control for most of the game. It was a shame to concede twice late on, but we can overlook that. Mablethorpe are next in action on Saturday, April 4, at home to North Thoresby in the league at 2.30pm. Mablethorpe (4-2-3-1): Pittam; Brownson, Bebbington, Billingham, Williamson; Sirett (c), Carter (Rolleston 80); Twigg, Mail, Mackay; Hanley (Turner 64).